Reading "The Wire: Season Four"
“Are you a tenor?” a woman asks me in not the friendliest tone as I slip into a vantage spot — fourth row, dead centre, in the Alix Goolden Hall, the former sanctuary of a former church, now the Royal Conservatory of Music. I look around for my friends C and J. We had planned to sit together. I finally spot C who looks like he’s looking for me. We connect and he tells me he was sitting with J and the Altos on the left side of the hall until discovered and sent packing to the Tenors. It’s clear we’re not going to sing along with the chorus in the Civic Orchestra of Victoria’s Sing-Along Messiah. We ARE the chorus. They’re handing out vocal scores over in one corner. I’m a little nervous now. I haven’t sung the Messiah in over thirty years. Haven’t debated the merits of various performances of it, either, since my father died. It was one of his favourite works. We saw it together at Carnegie Hall in New York City once. 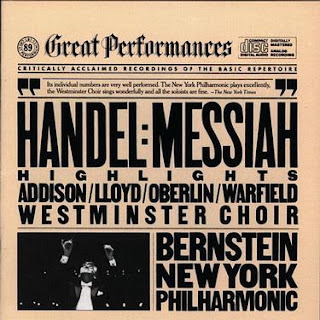 Conductor Leonard Bernstein was taken to task by critics afterward for messing with the structure and substituting a calliope for the organ but I found the entire performance magical. This afternoon we are conducted by George Corwin, a former professor of music at the University of Victoria. He peers at us over bifocals and has us stand for a brief rehearsal. I’m right back in Choirdom, my eyes moving from the score to his hands, my awareness of those around me — my fellow sopranos, my collaborators for the afternoon — heightened. The centre section has indeed filled up and I estimate the chorus at 600. The sound is wonderful. A whole lot of these people can sing. I’m no longer a soprano I realize when I’m able to hit only every other high note. I try not to screech. The performance includes nearly all 53 solos and choruses. The music still moves me, still lifts me up. I want to sing the solos, too. 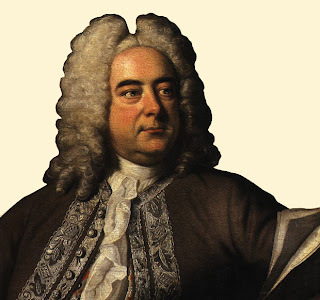 I once thought Handel composed Messiah in a divinely inspired trance. But according to the program he wasn’t enthusiastic when he received the libretto from Charles Jennens. It was only when pressed to produce a new oratorio as a benefit to charities in Dublin that he turned to it. He composed Messiah in about three weeks. It is the most frequently performed of his oratoria. I wonder if he felt it his best. Imagine tossing off a story to meet a contest deadline and being forever known by it, the ones you laboured over longer ignored. By performance end, the bit of voice I started out with is gone. C reports that the basses started a measure too soon in one of the choruses but I didn’t notice. J shakes her head in awe at how so many people knew when to come in. Maybe they, too, were raised on this music. Maybe the Messiah has taken them back home for a few hours. You (and Tamara) are very brave. I wouldn't even know which section to choose! I love the idea, though, of audience participation. I hated this piece when I was a teenager. I was a champion of rarer more modern pieces of classical music (even contemporary and even Canadian ones, gasp!) so this piece was just way too popular. I used to call it the "Love Boat of classical music", which might tell you when I was a teenager. Now, since I'm actually listening to music rather than just getting my political knickers in a twist over it- I find that I love it. I sang in a choir during university and there's something about it that is very special. I hope kids today are getting to sing together in school- my guess is it's falling by the wayside along with other things. More foolish than brave, probably, Anne. And, Andrew, anything popular should be suspect. After all, what do the masses know? When I was a teenager I tried to show my independence by going to foreign films, some of which I didn't "get." One I particularly loved was a Russian film called (I think) "Ballad of A Soldier." Wow, (and Tamara) only sang with about 9 others, and to an audience of about 25. For a first performance, that was plenty. Your experience likely would have overwhelmed me to silence. Hopefully, as time goes on I will become more courageous. I would have liked to see your performance though. It's rather exhilarating, isn't it? If only writers were given such instant applause upon completing a story. Hey, (and Tamara), I saw that Vancouver has had a sing-along Messiah for 27 years. Maybe next year for you?